Pennsylvania Gov. 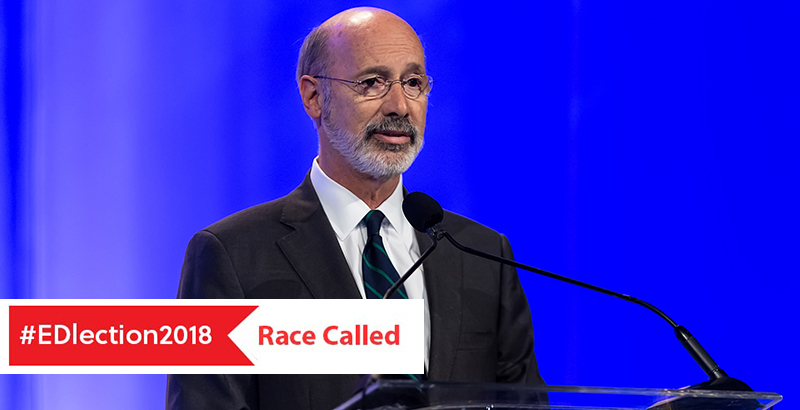 Tom Wolf, a Democrat, is projected to win a second term, defeating Republican challenger, Scott Wagner, according to NBC. Education was a key issue in the campaign, with Wolf touting increased funding flowing to schools during his tenure, though The Philadelphia Inquirer notes that most of that money went to pension costs for the state’s school employees. The paper reports that basic education funding increased by about 10 percent while Wolf was in office. Wolf was first elected four years ago on a promise of reversing cuts made by the previous governor, Republican Tom Corbett. One of his biggest backers this time was the state teachers union, the Pennsylvania State Education Association. “The governor ran being an education governor, and he’s not disappointed us,” Dolores McCracken, the union’s president, told the Inquirer during the campaign. However, many of the campaign promises he made in 2014 haven’t been enacted, the paper reports. Wagner, a former state senator, also made education a major part of his platform, saying he would provide grants for high-performing teachers and increase education spending without raising taxes, in part by privatizing alcohol sales in the state. Wagner and Wolf are both businessmen from York, Pennsylvania, where the local paper endorsed Wolf. President Donald Trump endorsed Wagner, who observers said was using the president’s campaign playbook. Trump won Pennsylvania in 2016, but 52 percent of likely voters there disapprove of how he’s doing, a recent poll conducted by Muhlenberg College and the Allentown Morning Call found.